The term Phyllodes originates from Greek word "phullon" which means a leaf. 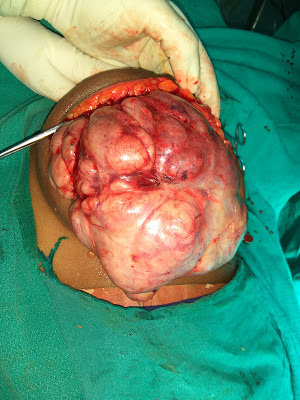 It is also called as Cystosarcoma phyllodes. Here is a picture of a Phyllodes tumor recently operated by us. The patient was a 38 year old female with complaints of swelling in Left breast of 6 months duration which was fast growing in size. Phyllodes tumors are a fibroepithelial tumor composed of an epithelial and a cellular stromal component.